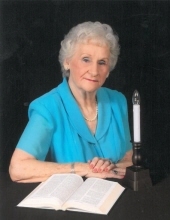 Dorothy Annelle Humphries, 84, of McDonough, formally of Rock Mills, Alabama, passed away March 20, 2019. She was born in Rock Mills, Alabama on April 8, 1934 to the late William Daniel and Tommie Lois Holder. Dorothy retired from the Federal Government as a Logistics Specialist for the United States Army. She was a long time member of Covenant Presbyterian Church. Dorothy was preceded in death by her siblings, William “Bill” Holder, Chrystine Holder Hester, and Mary Faye Holder Dunn; and her parents. She is survived by her husband of 65 years, James Calvin Humphries; sons, James Ricky Humphries (Denise), Tony Randall Humphries (Leann), and Timothy Jay Humphries (Tammy); grandchildren, Adam Humphries, John Humphries, Ian Humphries, Avery Humphries, Ashley Humphries, and Christopher Humphries; and two great-grandchildren. A funeral service will be held at Covenant Presbyterian Church, Fayetteville on Saturday, March 23, 2019 at 1:00 PM. Burial will follow the service at Eastlawn Memorial Park, McDonough. The family will receive friends from 6:00-8:00 PM on Friday, March 22, 2019 at Mowell Funeral Home, Fayetteville. The family requests flowers, or a donation to Covenant Presbyterian Church or Southern Grace Hospice. To send flowers or a remembrance gift to the family of Dorothy Annelle Humphries, please visit our Tribute Store. "Email Address" would like to share the life celebration of Dorothy Annelle Humphries. Click on the "link" to go to share a favorite memory or leave a condolence message for the family.